Most professional engraving artists could probably engrave with any tool and turn out nice work given enough time; however, tools with improved design help make the hand engraving process easier and quicker. The AirGraver® is the most advanced system for intuitive ease of use for the professional or beginning engraver. Engraving Artist Steve Lindsay www.EngravingArtist.com originally designed and made the AirGraver® tool for himself because of a need to increase his engraving speed and yet maintain the quality of his work. This is not say that any work should be rushed through. In delicate areas, more deliberate work will need to be done, but there are also some parts of a project where, with confidence, faster work can be done. 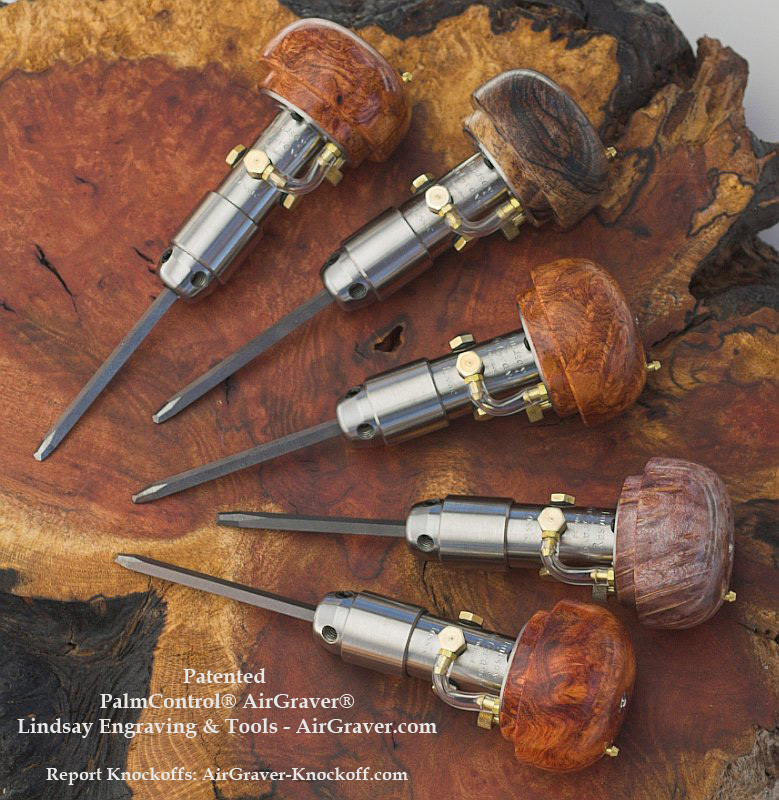 The amount of time it takes to engrave a project is foremost and the speed at which the AirGraver® can physically cut through metal when needed is at least three times that of the spring blow-pulse design tool Steve Lindsay used for 20 years. That earlier tool was designed by Steve's father, Frank Lindsay (a watch maker, jeweler and gemologist) in 1979. The spring blow pulse design can still be found on the market. The improved system is called an AirGraver®. Perhaps it should not be labeled a system because the tool itself is the entire system. The box that used to be upon the bench creating pulses of air for the earlier machine is not needed with the new AirGraver® design. The AirGraver® is also unique in that the speed and power increase proportionately. 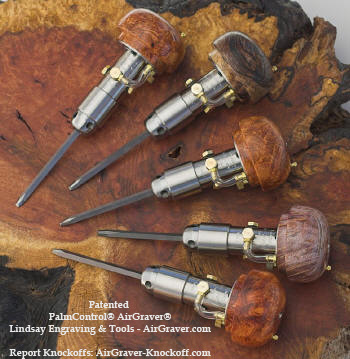 This allows the benefit of increased speed to move a graver point through a cut when desired. The older blow pulse design tool would only increase in power and not speed. The operator had to reach up to a separate box to change the speed. The end result of the AirGraver® is a very transparent throttle response. You can start and finish engraving jobs more quickly and the quality of the engraving is much improved. The Classic AirGraver® includes a ring or barrel around the outside of the tool that works in a manner similar to the focusing ring on a camera lens. The ring is used to simultaneously adjust the impact speed and power of the tool. Either the PalmControl® or a foot control pedal is used to vary the air pressure power within each setting range. This mechanism makes one AirGraver handpiece as versatile as a variety of different-sized impacting gravers.